This cake is the ‘Simply Chic Pink Roses and Blossoms’ wedding cake. 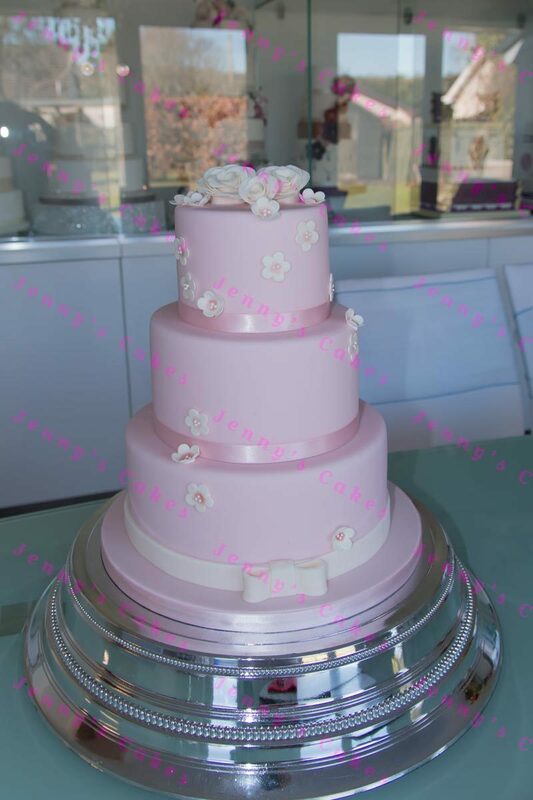 This cake is coated in a soft blush pink sugar-paste, with a white sugar bow and ribbon around the bottom tier, and contrasting ribbons on the top and middle tiers . Each tier is decorated with small sugar-crafted blossoms to contrast with the base colour, and the cake topper features cream roses and blossoms. There are choices for colour theme, and also options for flavours for each of the three tiers, such as lemon, victoria sponge and vanilla sponge. You can select the date for collection, or options for delivery to your venue by our staff.